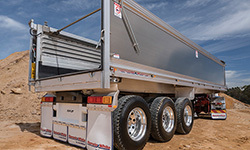 Landslide®, owned by MaxiTRANS, is the only proprietary tipper liner in Australia and available as an option on all Hamelex White standard width trailers and bodies. Because it’s owned by MaxiTRANS, the tipper and liner can be engineered in unison, ensuring the ideal tip. 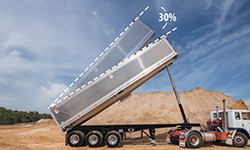 Landslide reduces the tip angle by up to 30% when unloading an end tipper, compared to a tipper with no liner installed, reducing the trailer’s centre of gravity and providing a safer more stable tipping platform. As a result the height of the tipped trailer is also lower, reducing he chance of it making contact with overhead obstacles. Improving the trailers aesthetics, Landslide is affixed using a method which eliminates the need for unsightly rivets. This process also reduces the number of catch points inside the tub, resulting in better product discharge. 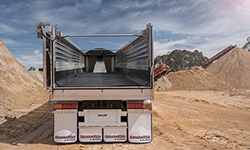 The reduction in required tipping angle lowers the trailer’s centre of gravity, providing a safer and more stable tipping platform. Further, the height of the tipped trailer is lowered, reducing the chance of making contact with overhead obstacles. 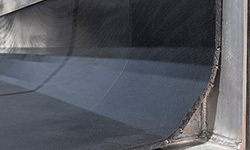 With one of the best coefficients of friction available in its category, Landslide® can reduce the required tipping angle by up to 30% when unloading. This means that in some cases, an entire stage can be removed from the hoist. 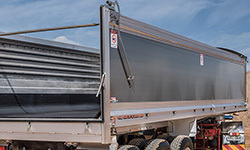 Landslide® gives your trailer additional impact and abrasion resistance, protecting the tipper body from wear. 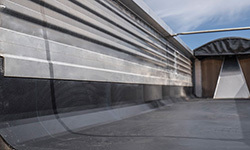 For improved functionality, Landslide® is affixed using a unique method which removes the need for rivets, resulting in fewer catch points in the tub for better product discharge. The unique attachment method removes unsightly rivets on the outside of the tub for a better aesthetic appearance. Landslide® is UV protected, reducing the chance of additional damage to the liner material caused by exposure to the sun.